Dr Eva Tongue passed away on 7 December, 2012, after a long illness. Born in Budapest she was a scientist and researcher with an interest in the alcohol dependency field. She met Archer, her future husband and Director of the International Council on Alcohol and Addictions, at an international conference. They married soon after and settled down in Lausanne happily creating a family from their children from previous marriages and their own children. Joining Archer in his work at ICAA, Eva extended the work of the organisation to include other drugs and gambling. For many years she was the only NGO representative from a specialist NGO attending UN and WHO meetings concerned with narcotic and psychotropic drugs. 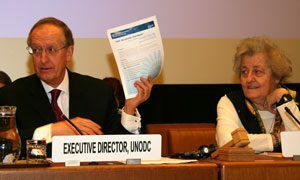 This led to her having a special and unique relationship with the Directors and Executive Directors of, successively, the UN Division of Narcotic Drugs, UNDCP, UNFDAC and finally UNODC, as well as with those responsible for drug misuse policy and stratgey in WHO, ILO and UNESCO. It was also from this strong base that she conceived the idea of forming the VNGOC. 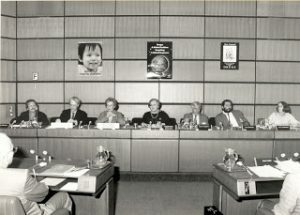 Supported by the then Executive Director of the UN Division, she brought together a number of NGOs represented at the UN Office in Vienna and the committee was established in 1983. It was through Eva, with support from t he Swedish Government, that the first NGO world forum was held in Stockholm in 1986. This was followed in 1987 by a second forum in Vienna during the UN International Conference Against Drug Abuse and International Trafficking (ICDAIT). The material from Stockholm and from the Vienna Forum fed int o the final documents produced by the ICDAIT with a number of sections using the wording submitted by the NGO Forum. The third NGO forum in Bangkok (1994) was also led by the VNGOC although the organisation was undertaken by UNDCP and its Declaration was presented to the UN General Assembly by Sweden. This Forum was held at a time when drug related problems were a major concern globally and the number of NGOs active in the field had grown considerably. The leadership and experience of Eva was invaluable for many organisations as she helped them establish an international presence and contribute to the work of the UN system in responding to drug problems. 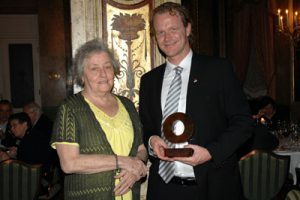 Eva was a passionate and dedicated chair of the VNGOC for many years in addition to being Executive Director of the International Council on Alcohol and Addictions. Eva was a dear friend to many VNGOC members, an ardent advocate for NGO rights and a consummate diplomat earning the respect of many across the globe. Her legacy continues to live on through our work.